When I asked Bill what he would like me to prepare for him while I am gone for a few days, his answer was an unequivocal "Mousse please!". Yes, he is a softee and I know his mom spoiled him with homemade desserts pretty much all his life so his answer did not come as a surprise. I did prepare a few things to warm up after work during the five days I'll be gone but I know Bill. When I showed him where everything was in the fridge, his eyes immediately landed on these Vanilla, Salted Butter Caramel and Chocolate Mousses. And they were all the way in the back. Of course. So where am I going for 5 days that he needs a fridge full of goodies? San Francisco! I am attending the 2009 BlogHer conference which will be held on Saturday. I am also one of the speakers at the conference! I am so psyched about this event for so many reasons. For starters just take a look at the program here. All these amazing bloggers giving of their experience and expertise, I am honored to be among them and hope to contribute as much as they are. Then there are all these attendees that I will finely get to meet in person and finally hug silly until they call security because Tartelette is cutting their air supply from excitement! Friends kept tweeting they wanted to meet me, well I want to meet them just as much. Last May, I was supposed to join Bill on a working trip near Jen from Use Real Butter and we immediately made the plan that I'd stay with her a few days while he'd work. That plan fell through. We were both upset at the circumstances and she asked if I'd be coming to San Francisco for BlogHer. She was. Maybe we could meet up there. This summer has been financially sucky so we were pretty much tied down not going anywhere for a long time. She emailed back the same day and said in her usual ways "Damn it Helen! You're going! Here are Frequent Flyers miles we are not using and you are sharing a room with me. Get a conference ticket and we'll figure something out." Yes. That is the kind of chick Jen is and I am proud to call her my friend. She rocks. Period. Man! Those tickets were hotter than the best Nutella crepes on a street cart in Paris. They sold out before I could even log on the computer. So waitlist it was. Drats! Then my name got tossed in the hat for potential speaker and the wait began. Either a ticket would come open or I'd be a speaker in which case I would not need one. Nothing happened on either front for a very long time. Then, I finally scored a ticket and three days later got an email about being a speaker (in case you are wondering, that ticket went back in the ticket pool). Well, I am not done being psyched because my friend Anita from Married With Dinner extended an invite to stay with her a couple for a few days passed the conference and of course I jumped on it! Finally we get to hang out! We have plenty of fun things planned and I can't wait to tell you about it through pictures and emotions. There will be plenty of dinners, lunches and stories shared with friends and strangers and I hope to post a few fun shots while I am gone. I know by now you must be pretty tired about me gushing about the next five days, so I will shut up and give you back some of the "good schtuff" I am lucky to experience everyday by hosting a little giveaway. Aprons sample, for more colors and motifs, check The Hip Hostess website. To win one of these adorable demi style aprons by The Hip Hostess (winner's choice) all you have to do is leave a comment on this post between Thursday September 24th and Sunday September 27th, midnight Eastern Time. My dear husband will draw the winner at random and I will put her/him in contact with The Hip Hostess to pick the preferred demi style apron. But that's not all! Deborah from The Hip Hostess generously offers all the readers of Tartelette a 15% discount on any order throughout October 15th 2009. Use the promo code TART (all caps) at check out. Very cool! Enter Jen's to win an Ipod Nano and enter here to win a fabulous apron handmade by The Hip Hostess, so you can bake and groove in style. And no, we did not plan it, would not have worked, ahah! Those aprons are adorable! I'd love to win one. I love reading your blog. Your photographs and recipes are beautiful! I love your blog. The photos are great and it is fun to follow your culinary adventures. I have yet to make any of your creations but hopefully this weekend will be the one. Have a great time at BlogHer. Have fun at the conference! I hope I win an apron while you're away! I love your sight and it gives me such wonderful inspiration to spend more time in the kitchen! Thanks! I loved reading thispost, from your earlier post and from jeans place i knew you both wre good friends. Loved Tartelette is cutting their air supply hi hi i was laughinh out loud here. Enjoy you time in theblogher meeating. Wish i had the patience to make this beautiful and dleicous dessert. Love the apron. Will check out the site. I would also stalk those mousses in the back in the fridge. So kind of you to give away an apron, they're all lovely. Have a wonderful time at BlogHer! These aprons are absolutely adorable! I love them. The mousse looks so good! And the black and white demi apron is adorable! Have a wonderful time in SF (you'll be in my neck of the woods)! I hope you have an awesome time in SF & definitely post plenty of pics! Happy travelling! Between the aprons and the dessert, I'm in heaven! Your recipes are not only amazing but gorgeous! They look like tiny pieces of art! You motivate me to push myself harder in the kitchen! Have fun at the conference--it sounds like it'll be great! You are my favorite food blogger! I positively drool over each and every post. Let's face it: presentation counts. Where do you buy such fantastic verrines, ramekins, bowls, etc for your masterpieces?! Must try this recipe - thanks, it looks marvelous!! Those look gorgeous. You do perfect layered desserts. So pretty. I would so have loved loved loved to go to Blogher... but it's not gonna happen! Maybe I can then also some of that gorgeous chocolate mousse? Just to make me feel better too..? Have an insanely fantastic time over there Helen! I'm sure we will hear all about it when you're back! The aprons are so cute! Right now I'm rocking a clasic blue and white striped full on apron from Williams and Sonoma and would love another to work in the rotation. An apron for every mood! Gorgeous aprons! And desserts, of course, as always lovely. Oh my gosh that mousse looks good. Lucky husband! Good to know I am not the only blogger that does not have money for things like BlogHer--that's awesome that Jen came through for you like that. The aprons are adorable. so happy to hear that you get to connect with some of your blog pals...amazing! also happy to hear that things worked out on that front as well, it will be a blast i'm sure! This recipe looks wonderful. I hope you have a great time at the conference. Maybe you and The Pioneer Woman can get together. Absolutely fantastic - dessert, photography, and a giveaway! Have a safe and wonderful trip. Where can I find those clear spoons...they look fabulous? and the aprons are so adorable! Yes! I will, in fact, be the hippest hostess in one of these aprons! salted butter and chocolate is just the divine mix according to me! 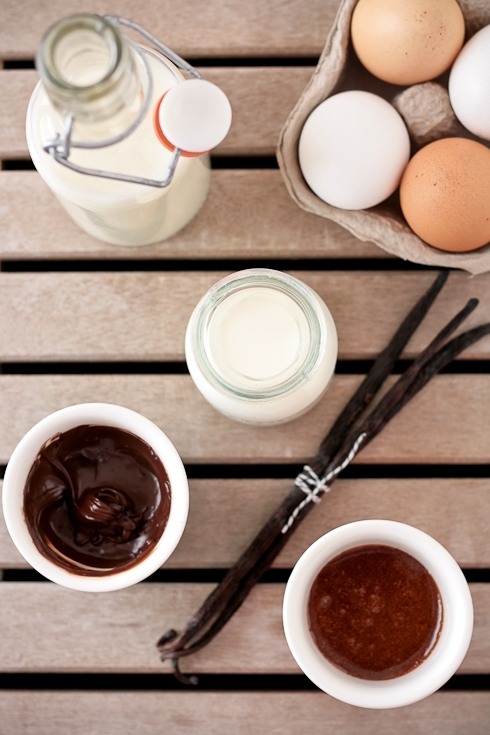 your recipe and picture are just so tempting! Have a good time in S.F. You are fabulous! I can't wait to try this recipe! And the aprons... oh my. I have developed an obsession with aprons over the past couple years, and I would just LOVE to add one of these to my collection! Thanks so much for the opportunity to win one! The Mousse-- It is just beautiful! Love those aprons, and the mousse, not sure which one I want more right now (pretty sure it's the mousse). Hope to see you at BlogHer! aw, you are so sweet to give us a shout-out... we are so excited to have you come visit us at last! YUm, I know how great those salted caramels are. Have fun in San Francisco, wish I could go as that's my favorite city in the U.S. You'll do fantastic as a speaker! J'aimerais trop etre une HIP HOSTESS!!! I would love to be a hip hostess! now that is one cool apron. Beautiful aprons - beautiful photography. I am always so impressed! Oh my goodness these look wonderful. Those aprons are so cute too! Have a safe trip! And I must say Bill is sure lucky to have you! :)You stock up so well!! I love your blog, am salivating over the mousse, and would love an apron! The other day I narrowly escaped getting bacon grease all over my work outfit, so I think I need it! A chic apron? I hardly knew there was such a thing! I'm jonesing for it! These look wonderful! I can't wait to make them. Thanks for the giveaway. The aprons are soooo cute! Apparently I've just been keeping an eye on you in my reader, because I'm pretty sure I haven't seen the new blog design- it's beautiful! I love the blue-gray neutral color scheme. Anyway, have fun in San Fran, I'm super jealous! Oh dear! I'm gonna try this real soon for my family!! Thanks for sharing Helen! And, all the best at BlogHer!! Awaiting your good news! I live in San Francisco, and hope you enjoy the city as much as I do! Have a wonderful trip. Those mousse cups look divine! Seriously. Even if you weren't giving away the cutest damn aprons, I've ever seen, I'd still be forced to tell you how damn delicious those look. My mouth is watering and it's still breakfast time. It's my hubby's birthday today, so may I will have to make these now instead of mocha cake. Mmmmm. The aprons are great, but that mousse is beyond words. Can't wait to try it! Oooo cute aprons! Thanks for organizing this! I've never made mousse before, but I'm tempted to make these! Beautiful aprons, by the way. And I look forward to hearing all about the conference! Good luck and have fun at BlogHer! The mousse looks amazing! And of course I'd love an apron and they are just so pretty. Have a great time at BlogHer! (2) Your blog makes me want to eat my computer screen. Today's delicious dessert is no exception. My only fear about making it is that I would horde all of the final products and just eat them until I was in a dessert coma. (3) Those aprons are so cute! I'd love to have a demi-apron. I'm going to keep my fingers crossed that I win it, but if I don't, I just may have to use that 15% offer. Those aprons are a MUST have! Travel safe - come back soon - we'll miss you!! putting the mousse on the "to bake list" and the aprons on the "to buy if i don't win list"! The mousse looks so delicious! Thanks for a great giveaway! Love, love, love the aprons! I'd probably have spotted the dessert right away too. quel dommage that i haven't got any time this weekend to try it..
Those aprons are adorable. I wonder how cute it would be covered in flour and goo. I'm such a messy cook! Is this the kind of caramel you are not supposed to stir while it is on the fire? Is there a "stage" I should be looking for or a temperature? The conference sounds like it’s going to be terrific. I hope you have a blast, and I’m looking forward to reading all about it when you get back. I hope I can go next year! and those demi-aprons.... WAY too cute! I'd love to cook in style ;-)! Have a wonderful trip. SF is the best. The desserts look soooo good! An apron like the ones in the giveaway would be great- just in time for moving into our new house and NEW kitchen! I've been wanting to try one of your recipes with salted caramel, so this gives me another option. 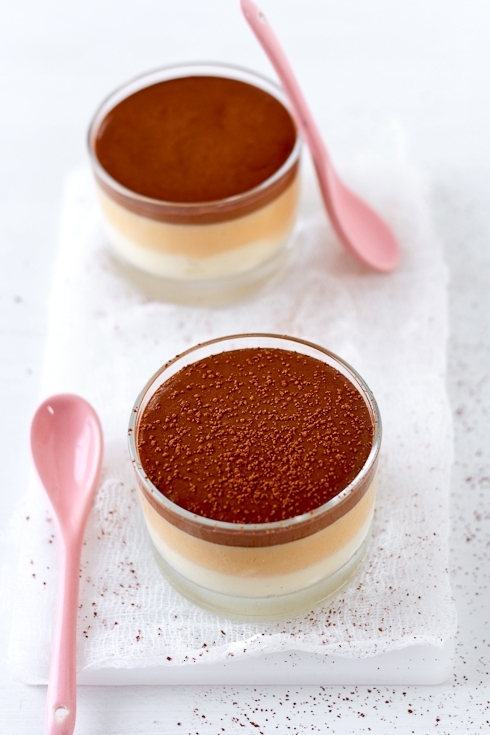 The mousse looks so delicious, and I especially like seeing the layers through the clear ramekins. So exciting about the conference....the mousse looks positively incredible....and those aprons? Super cute! Oh my gosh, this is so beautiful. I must try mousses again after my last failure, but we so rarely have dairy around. i adore your & jen's blogs. i read them every day, and on your off days, i re-read old posts. i remember reading, on both of your blogs, when your trip didn't work out in may, and i was bummed FOR you, haha. all of that said, however, i was surprised when, as i read about jen donating frequent flier miles to you, my eyes started to tear up, and i found myself saying "ohmygoodness!!" out loud...at my desk...at work! what a wonderful treat this upcoming trip will be! i can't wait to read all about it. i wish i could be a fly on the wall during your presentation - you're going to do fabulous!! Have an absolutely fabulous trip! Oh, I'd love a new apron! They are so cute! OH, my goodness that mousse looks AMAZING! It sounds like you've had quite an adventure! LOL! I love hearing about what a sweet tooth Bill has! It's so funny. Congratulations about the speaking opportunity! Congratulations on being a speaker at the BlogHer conference, and good luck with everything! I would love one of these aprons! It would keep me much neater while I cook... I tend to get a little messy in the kitchen! And the dessert looks incredible. I may have to incorporate it into my menu in the next week or so. Yum! i think i'd rather have the dessert!!! but i guess i'll take the apron! Everyone needs a friend like Jen. Everyone. I hope you have fun in SF. Take lots of photos! jen does rock and so do these. making bill happy! The mousses sound delish, will have to try the recipe. I was looking for a recipe that used yolks (because I want to use the whites for macarons), and this one is just the thing! Thanks for the lovely recette and photos. BlogHer sounds wonderful! Have fun! That dessert is gorgeous and I love love love those aprons! That mousse looks divine. I love the different layers! You had me at salted butter caramel. Divine! And the aprons are fantastic too! Oh these are adorable! I think I will be purchasing even if I don't win, but here goes.... Thanks, and enjoy the conference! Love those aprons! So cute! And I wish I could go to the BlogHer conference sometime. The mousse sounds fantastic. Beautiful mousse and beautiful aprons! your blog brightens my days...as would one of the aprons from the hip hostess! kudos on speaking at blogher conference & i did click on to see the amazing company you are keeping! have the best time & we cannot wait for your post telling us all about the conference & visiting anita! take it all in helen!! I love these aprons! So cute! Also I'm totally drooling over the mousse. I will have to try this recipe! I think it would improve my cooking if I wore one of those aprons!. Have a great time at the conference. These aprons are adorable, and I just adore mousse! Thanks for hosting the giveaway and sharing the recipe. oh my goodness! those aprons are fabulous! must get them for christmas gifts this year! These look amazing and I must try - the salted caramel is what hooked me! Your site is beautiful! Man, you always know how to get me. Just today I was pondering what kind of mousse I should make and then you come out with these babies. They look wonderful Helen! Just what the doctor ordered. I hope you have a wonderful time in San Francisco! The conference sounds like it will be so much fun! I *have8 to try this recipe! It sounds and looks so delicious! Hello! Longtime reader, occasional commenter here. The aprons are just adorable, and I began drooling the minute I clicked over to the post, especially once I read "salted caramel"! The mousse trio is really nice for presentation. Of course, the taste of salted butter caramel is going to be good regardless of how it looks. I *have* to try this recipe! The mousse looks and sounds so delicious! yummmmy dessert.your husband is one lucky guy! Those aprons look gorgeous too! I would love to win one! I love this blog. I have made several recipes and they have been fabulous! The aprons look darling too! I would love to win one of those aprons! Oh wow, I would have loved to go to that conference! Any idea if they have plans for having one in Chicago any time soon? And the mousse look delicious as always. By the way, where did you get those glasses? They look specially made for these kinds of desserts and I've been looking and just can't find anything similar. Leave a comment,huh? Well, I look at your blog everyday to make sure I don't miss anything. And I would love one of those aprons. Your desserts rouse so many sweets fantasies in me. Congrats on being invited to speak at the conference and thanks for having giveaways too! How exciting! I hope you have a wonderful time and look forward to reading your posts regarding the conference. Hummm!!!!! 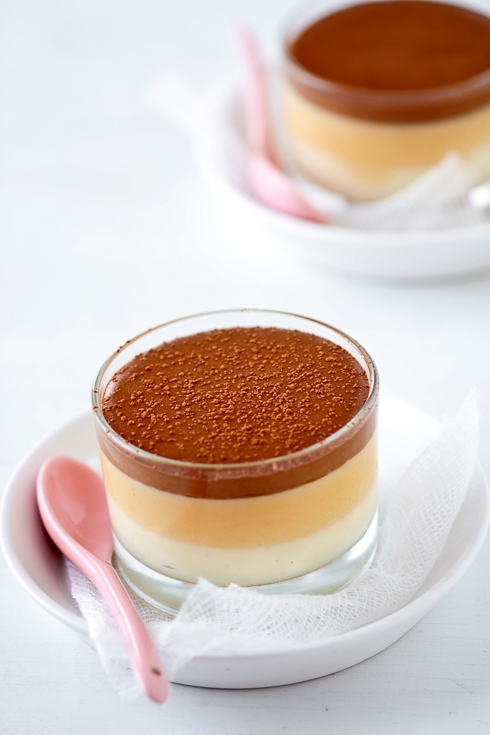 Ilove all kind of mousses, but I prefer vanilla mousse and chocolate mousse... Beautiful pics!! I always enjoy your blog-- have fun at the conference! MMM mousse! Bill is a smart man. Love the aprons, so cute. Je suis sûre qu'un de ces tabliers m'irait très bien! I love the apron!!! And the mouse looks delish!! My virgin post! Like everyone, I am so taken by your photos. Great incentive! I have been told that cooking is my 'terapy'!! Wish I loved gardening or housework as much as I love cooking. Ah well- a blessing & a curse- yes? Can't wait to try this luscious mousse. Knock their socks off in SFO. Have fun. LOVE that city. Do you know how amazing you are? Oh my!! 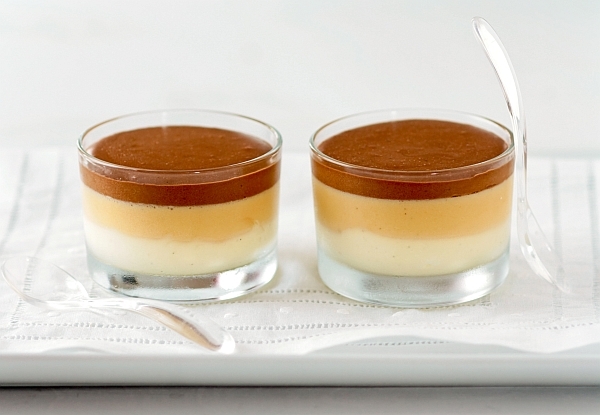 This desert is stunning in presentation and vibrant in decadent flavours! Your photos are so gorgeous as always!!! What a lovely giveaway! Crossing my toes, those aprons are so cute! My fiance doesn't like caramel and even though I try and convince him that it is all in his head...no dice. So because I never get caramel, this is making me want it even more!! Gorgeous aprons, and gorgeous mousse! Am having a broken-hearted friend over this weekend to try to cheer her up - I think these mousses will certainly help! Thanks for all your great recipes. That dessert looks and sounds delicious! Happy travels to SF! Ti leggo da tanto tempo: i tuoi dolci e le ue foto sono davvero deliziosi. Oggi, grazie ai grembiuli, mi sono decisa a scriverti! E grazie per la splendida idea che mi hai suggerito per un dono speciale ad una cara amica. A presto. Love your blog, beautiful photographs and the apron. thanks for introducing The Hip Hostess to me. I can see why his eyes jumped to those...I would have made a grab for them too. Now, because of you, my weekend will be filled with them. Thank you! oh my goodness. you and all my internet heros are coming to my town! have a wonderful time. the weather is going to be great this weekend. btw, i love those aprons. i think i will order some fror xmas gifts! Marina: yes, let the sugar and water boil without stirring. Just take the pot off the stove when it reaches caramel color (around 300F). Re-glasses: I found these while antique browsing last summer. Visit your local antique stores, they are full of surprises! The mouse are gorgeous, I love the fall flavours. the mousse is unfathomably mouthwatering! I want to enter for the beautiful apron!!! Eat some really good Sourdough Bread while your there! Yummy..... and this mousse... is a must! Congrats on your blog. Been following your blog from the Dominican Republic now for more than a year. I have tried a few recpies myself always with a great result. Sorry if this doubles... Please eat some of that San Francisco Sour Dough bread. Oh it is soooo good! Yummy.... Speaking of which this mousse speaks to me and I guess I will be eating some along with Bill. Have Fun! Those aprons look great, but the mousses look amazing! Those mousses look divine, and so do those aprons! Helen, these aprons are ADORABLE with a capital A!!! This recipe looks amazing too, I love salted caramel! Mmm! Oh my gosh I love your site and I ADORE those aprons! Have a great trip - I hope you get to meet Ree she seems so sweet! Caramel and chocolate. Can't wait to try this recipe. My better-half will love it. The mousse looks fantastic! Thanks for the giveaway. Mmm, looks delectable just from the pictures! Your husband sure is lucky! oh how I wish I were going to the blogher conference! I would so very much love to meet you and hear what you (and all the other speakers!) have to say! Have a great time in San Francisco! Yum! That's the first thing I'd notice, too. The stripes kind of remind me of candy corn...thinkthinkthink. Bill is a lucky man. Have a great time on your trip and at the conference (Jen does rock!). I just love The Hip Hostess' aprons and that's she's from Michigan, like me! thanks for the giveaway! I love the way your mousse looks. I have a chocolate peanut butter mousse with salted peanut brittle and caramel sauce on my menu right now! I'm an apron junkie! I'd love to add a new one! That mousse looks wonderful and has such a great combination of flavors. The aprons are very cool too and it would be a lot of fun to win one of them. those mousse (mousses?) look so good. i love salted caramel! and the aprons are adorable! Thanks for the giveaway. The mousse looks fantastic. I'm sure you will be hugged out by the time you get home - we (your fans) LOVE you! Have a great trip. This mousse looks absolutely divine! I can't wait to try it! *drool* oh yum.. is it ok to be craving chocolate mousse at 9 o'clock in the morning?! This recipe looks fabulous, and easy enough for me to try! I love your photography. Those aprons are so cute! And I sure wish I could try that tri-layered mousse! ooh - I wish I had mousse tucked at the back of my fridge when I get home from work... I'd love to win an apron too! Awesome giveaway - super cute! Love your food photography...this mousse looks super yummy!! Mmm, this looks awesome. I'll make some if I win the apron! Have a great time in San Francisco!!! Such adorable aprons! I would surely feel inspired to cook wearing one of those!